Objectives: In this study, the effect of cigarette smoke on the levels of inflammatory markers, interleukin-6 (IL-6), interleukin-8 (IL-8), and tumor necrosis factor-alpha (TNF-α) in induced sputum was investigated. Materials and Methods: Twenty patients with chronic obstructive pulmonary disease (COPD) (group I), 20 healthy smokers (group II), and 20 healthy nonsmokers (group III) were included in the study. The levels of IL-6, IL-8, and TNF-α in induced sputum were measured in these groups, and comparison analysis between the groups and correlation analysis for smoking load (pack-years) and spirometric parameters were performed. Results: Mean age of the patients in groups I, II, and III were 61.2 ± 1.7, 58.2 ± 1.6, and 59.1 ± 5.4 years, respectively (P > 0.05). 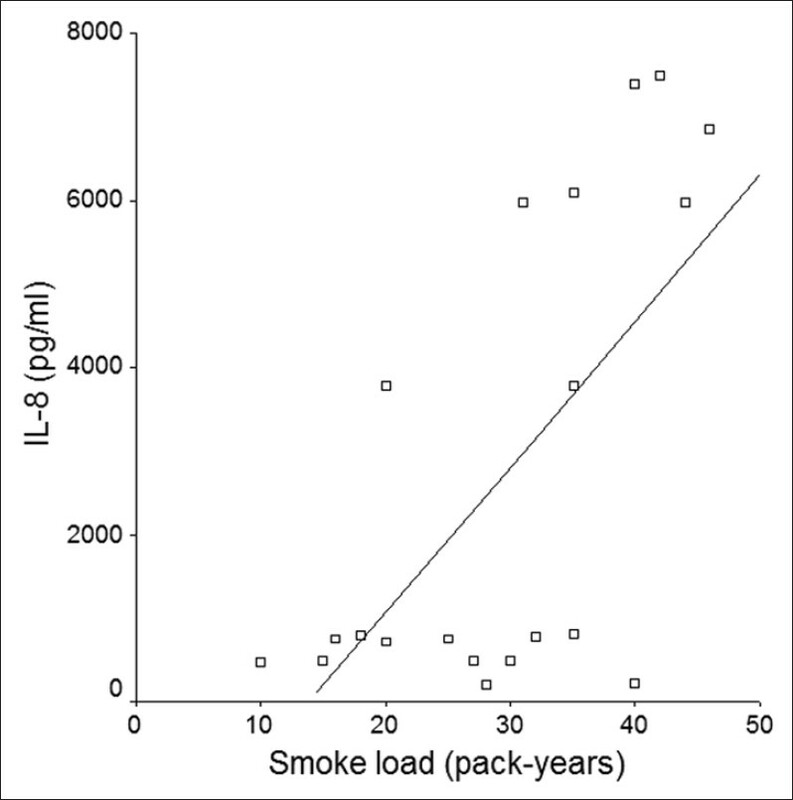 Smoking loads of group I and group II were 38.6 ± 2.1 and 29.5 ± 2.3 pack-years, respectively (P < 0.05). All cytokine levels were significantly higher in group I than groups II and III (P < 0.05). In addition to this, mean cytokines levels were significantly higher in group II than group III (P < 0.05). Smoking load of group II subjects was positively correlated with IL-6, IL-8, and TNF-α in induced sputum (P < 0.05). Conclusions: We found that inflammatory marker levels in induced sputum were significantly higher in COPD patients and smokers than nonsmokers. 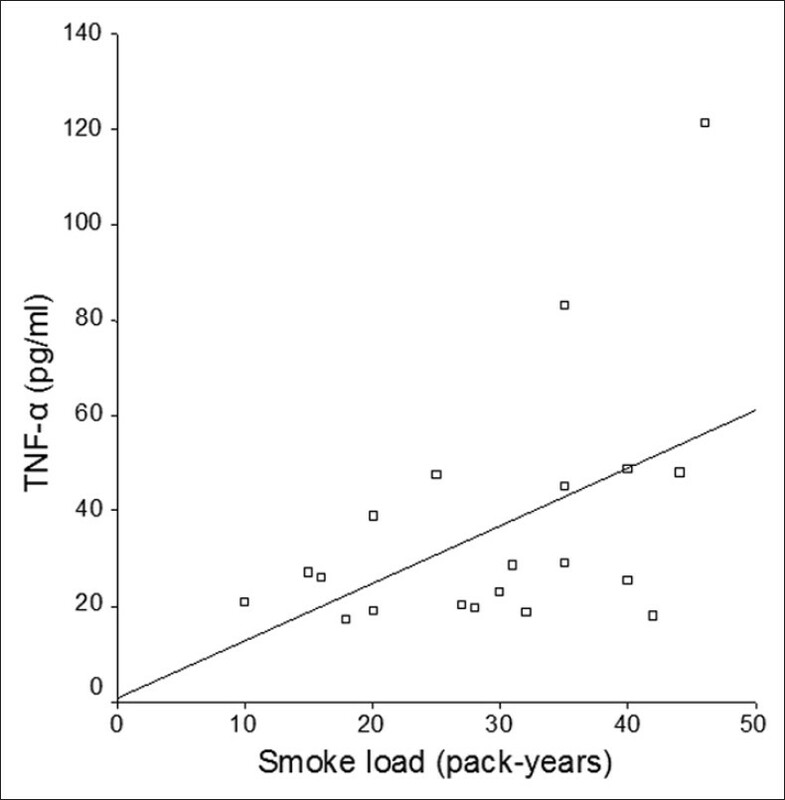 Moreover, there was a moderate positive correlation between IL-6, IL-8, and TNF-α levels and smoking load in the healthy smokers. We think that further studies are needed to determine whether higher levels of cytokine levels in sputum might be helpful in predicting the healthy smokers who will develop COPD in future. Chronic inflammation in the airways of individuals who smoke persists even after smoking cessation. We aimed to show whether COPD patients who continue to smoke has higher levels of IL-6 level, IL-8 level, and TNF-α than current healthy smokers and nonsmokers. We also aimed to analyze whether cytokine levels in induced sputum show any relationship with smoking load and the severity of airway obstruction. All COPD patients who were admitted to our outpatient clinics for an acute exacerbation were exclusion criteria in the study. All COPD patients were included in the study and were treated in a standard inhaled bronchodilators (inhaled long-acting antimuscarinic [tiotropium bromide 18 μg per capsule, one inhalation once daily], inhaled corticosteroid and long-acting β agonist [budesonide 160/320 μg/inhalation and formoterol fumorate dihydrote 4.5/9 μg/inhalation, one inhalation twice daily], inhaled short-acting bronchodilator [albuterol sulfate 100 μg/inhalation and ipratropium bromide 20 μg/inhalation, if required] and if supplemental oxygen. They were no medications except for COPD. The COPD patients were not enrolled at all if they had an exacerbation or utilization of systemic form of corticosteroid preparations (oral or intravenous injection therapy) within 1 month prior to the study entry. Antibiotics were not used where signs of bacterial infection existed. Since our long-term treatment policy for the patients with COPD did not include administration of maintenance oral corticosteroids, we did not see any COPD patients utilizing oral or intravenous corticosteroid therapy during the study period in the region. COPD patients admitted with specific reasons like pneumonia, pulmonary emboli, congestive heart failure, lung cancer, etc., were not included. All subjects had no other pulmonary disease including asthma, bronchiectasia, pneumonia, tuberculosis, or lung cancer. Additionally, patients with respiratory failure were not admitted to the Intensive Care Unit. In addition to this, while groups II and III patients were not utilizing any type of medication, COPD patients were also not utilizing any kind of medication, including theophylline preparations, diuretics, mucolytics, antibiotics, etc., other than inhaled bronchodilators. Posteroanterior chest films were obtained from all patients, and no abnormality was detected in the participants other than the patients with COPD. In their recent and past medical history, healthy smokers and nonsmokers did not describe any disease state which may interfere with their pulmonary functions. Smoking history [pack-years (number of cigarette packs per day multiplied by duration of smoking in years)] was taken from all group I and group II subjects. The IL-6, IL-8, and TNF-α levels were measured by the chemiluminescence method using an Immulite-1000 analyzer and special kits (DPC [Diagnostic Product Co., CA, USA]). The lower limit of detection for these assays was 5 pg/ml for IL-6, 2 pg/ml for IL-8, and 5 pg/ml for TNF-α. The interassay and intraassay coefficients of variation of the all assays were less than 10%. All statistical analyses were performed using SPSS 13.0 for Windows (SPSS, Inc., Chicago, IL, USA). Group data were expressed as means ± SEM. The data were tested for normality, non-normal data were transformed. Differences between the groups were tested using the Kruskal-Wallis test. Correlation between cytokine levels and different parameters (smoking load and spirometric parameters) was analyzed using Spearman's rank correlation coefficient. A P value < 0.05 was considered statistically significant. The mean age of the COPD patients (group I), current healthy smokers (group II), and nonsmokers (group III) were 61.2 ± 1.7, 58.2 ± 1.6, and 59.1 ± 5.4 years, respectively (P > 0.05). Group I and group II subjects had mean smoking load of 38.6 ± 2.1 and 29.5 ± 2.3 pack-years, respectively (P = 0.007). Of the COPD patients, 3 subjects fulfilled the criteria for GOLD stage I, 6 subjects were GOLD stage II, 10 subjects were GOLD stage III, and 1 subjects were GOLD stage IV. The PFT results for groups are shown in [Table 1]. Although group II patients are healthy subjects, their spirometric values were significantly lower than the group III subjects. However, their spirometric values were found within the normal range. Patients with COPD and other participants did not report any adverse event or worsening dyspnea upon induction of sputum. No significant change in FEV 1 before and after the inhalation of hypertonic saline occurred. The levels of IL-6 in the induced sputum were 393.6 ± 107.2 pg/ml for group I, 88.5 ± 23.8 pg/ml for group II, and 7.4 ± 1.3 pg/ml for group III. The mean induced sputum IL-8 levels for groups I, II, and III were 6541.7 ± 861.0, 2717.4 ± 632.7, and 385.9 ± 30.1 pg/ ml, respectively. TNF-α levels in the induced sputum were found to be 90.8 ± 19.6, 36.3 ± 5.7, and 13.7 ± 0.4 pg/ ml for groups I, II, and III, respectively. Comparison of all cytokine levels in induced sputum yielded statistically significant results between groups (P < 0.001). Smoking load of group II subjects was positively correlated with IL-6, IL-8, and TNF-α in induced sputum (r = 0.567, P = 0.009; r = 0.646, P = 0.002; r = 0.491, P = 0.028, [Figure 1], [Figure 2] and [Figure 3]). Cigarette smoking is accepted to be the most important cause of COPD, but only some smokers will develop clinically overt disease. Probably, the inflammation caused by cigarette smoke interacts with other host and/ or environmental factors to produce the excess decline in lung function which results in COPD. There are numerous studies investigating the relationship between cigarette smoke and airway inflammation. , In the present study, all cytokine levels in induced sputum were found higher in COPD patients than healthy smokers and nonsmokers, as well as these levels was found higher in healthy smokers than nonsmokers. In addition to these, the levels of IL-6, IL-8, and TNF-α were positively correlated with smoking load (pack-years) only in healthy smoker group but not in COPD group. Cigarette smoke activates alveolar macrophages and epithelial cells to release inflammatory mediators such as TNF-α and IL-8. , Mio et al. showed that bronchial epithelial cells isolated from major bronchi responded to tobacco smoke to release IL-8. Takizawa et al. found high levels of IL-8 mRNA and spontaneous release of IL-8 protein in small-airway epithelial cells in smokers compared with that in nonsmokers. Wang et al. measured the induced sputum IL-6, IL-8, and TNF-α levels in 20 patients with stable COPD and compared them with smoking and nonsmoking control groups. While the IL-8 and TNF-α levels in the COPD group were found to be significantly higher than the smoking and nonsmoking groups, IL-8 level in the smoking group was also found significantly higher than the nonsmoking group. The IL-6 levels, however, did not show any significant differences between the groups. Similarly, we also found the same results regarding IL-8 and TNF-α levels with one difference that IL-6 levels were also significantly higher in the smoking groups than the nonsmoking group and in the COPD group than the others. On the other hand, we found that healthy smoker group's inflammatory markers were higher from the nonsmoker group but lower from the COPD group. It is unclear if the IL-6, IL-8, and TNF- α levels in COPD and healthy smoking group were also higher before they started to smoke or they had given a higher inflammatory response to smoking. Like most of the previous studies our study was also a cross sectional. To understand this, long-term prospective investigations should be done. There are numerous studies in the literature which investigated the relationship between cytokine levels in the airways and spirometric parameters. Yamamoto et al. reported a negative correlation between the IL-8 levels in induced sputum and the FEV 1 /FVC ratio in COPD patients. In another study, FEV 1 was found to be inversely correlating with IL-6 and IL-8 concentrations in bronchoalveolar lavage (BAL) fluid. In addition to these, Kanazawa et al. found a positive correlation between the serum IL-8 level and the annual rate of fall in FEV 1 ratio. However, in a similar way with the study by Bhowmik et al., we also could not establish any relationship between cytokine levels in induced sputum and spirometric parameters in our study. We think that methodological variations between the studies mentioned above and limited number of participants in each study might have displayed these different results. The relationship of cytokine levels in the airways with smoking load has been vigorously investigated by several clinicians. Bhowmik et al. established a correlation between the induced sputum IL-6 level and the smoking load. Takizawa et al. 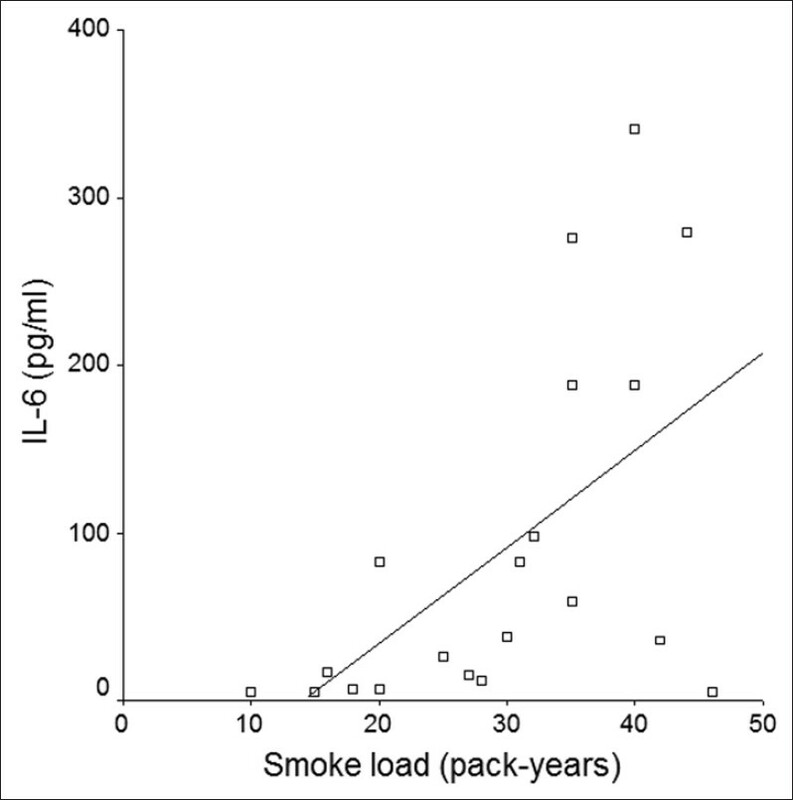 found a significant correlation between IL-8 mRNA levels and current amount of cigarette smoked. Kanazawa et al. found a correlation between the serum IL-8 level and the smoking load in patients with emphysema. In our study, correlation analysis revealed that there is moderate relationship between all relevant cytokine levels and smoking load in healthy smokers. Moreover, this relationship could not be shown in the COPD group at all. This finding is very interesting, and it implies that smoking load might be an indicator to predict the smokers who will develop COPD in future. Since a severe inflammation in the airways of COPD patients is already established and persists and progresses in a vicious cycle, cytokine levels are expectedly much higher in this group and patient-to-patient variation regarding the cytokine levels is not significant. Probably due to this fact, cytokine levels in the airways of COPD patients did not show any correlation with smoking load. Since long-term follow-up was not the scope of our study, we could not set any clinically significant cut-off value for the relevant cytokines and smoking load which might help to predict the healthy smokers in risk. However, we think that our findings lend remarkable support for designing further studies including long-term follow-up too in their methods. We believe that our study has several strengths. Sputum analysis is used increasingly as a convenient, safe, and noninvasive method of assessing airway inflammation, both in terms of cellular indices and soluble mediators of inflammation. The repeatability, validity, and responsiveness of the method have been confirmed. Finally, measurement of cytokines in sputum supernatants is used as a research tool, but requires standardization of procedures and, generally, analytical validation. ,, In our study, the interassay and intraassay coefficients of variation of the all assays were less than 10%. In future, smokers will develop COPD that shows you have a pretest or marker as cytokines. The findings of future large prospective randomized controlled trials could provide more definitive evidence. Some limitations of this study should be emphasized. A limitation of this study is that the numbers of COPD patients, healthy smokers, and nonsmokers were relatively small. Another lacks of present study, this could not be verified in our study because characterization of cellular components of the sputum was not performed. The lack of relationship between cytokines profiles in sputum indicates the effects of smoking or smoking cessation. In conclusion, cytokines levels were found higher in COPD patients and in healthy smokers than nonsmokers. In addition to this, there was a moderate positive correlation between IL-6, IL-8, and TNF- α levels and smoking load in the healthy smokers. We foresight that elevated cytokine levels in the airways and greater smoking load might help the clinicians to predict COPD development in a better way. These assays can be used to evaluate IL-6, IL-8, and TNF- α levels as a biomarker for lung disease and to monitor clinical practice in the healthy smokers and COPD. Further studies to explore the relationship between cigarette-smoking load and inflammatory responses, cytokines should been used evaluated to monitor clinical practice in the healthy smokers and COPD. We are indebted to OZKAN KIZKIN for their assistance with the clinical aspects and data management. OZKAN KIZKIN, MD, died of leukemia (AML) diagnosed in Inonu University. 1. Global Initiative for Chronic Obstructive Lung Disease (GOLD). Guidelines: Workshop report. Global strategy for the diagnosis, management, and prevention of chronic obstructive pulmonary disease. Available from: http://www.goldcopd.com. Updated 2003, 2006, 2008 and 2011. [Last Accessed on 2011 Nov 2011]. 2. Chung KF. Cytokines. In: Barnes PJ, Drazen JM, Rennard S, Thomson NC, editors. Asthma and COPD: Basic mechanisms and clinical management. London: Academic Press; 2002. p. 261-71. 3. Chung KF. Cytokines in chronic obstructive pulmonary disease. Eur Respir J 2001;34:50-9. 4. Garcia-Rio F, Miravitlles M, Soriano JB, Muñoz L, Duran-Tauleria E, Sánchez G, et al. Systemic inflammation in chronic obstructive pulmonary disease: A population-based study. Respir Res 2010;11:63. 5. Bhowmik A, Seemungal TA, Sapsford RJ, Wedzicha JA. Relation of sputum inflammatory markers to symptoms and lung function changes in COPD exacerbations. Thorax 2000;55:114-20. 6. Aaron SD, Angel JB, Lunau M, Wright K, Fex C, Le Saux N, et al. Granulocyte inflammatory markers and airway infection during acute exacerbation of chronic obstructive pulmonary disease. Am J Respir Crit Care Med 2001;163:349-55. 7. Hacievliyagil SS, Gunen H, Mutlu LC, Karabulut AB, Temel I. Association between cytokines in induced sputum and severity of chronic obstructive pulmonary disease. Respir Med 2006;100:846-54. 8. Bhowmik A, Seemungal TA, Sapsford RJ, Devalia JL, Wedzicha JA. Comparison of spontaneous and induced sputum for investigation of airway inflammation in chronic obstructive pulmonary disease. Thorax 1998;53:953-6. 9. Roland M, Bhowmik A, Sapsford RJ, Seemungal TA, Jeffries DJ, Warner TD, et al. Sputum and plasma endotelin-1 levels in exacerbations of chronic obstructive pulmonary disease. Thorax 2001;56:30-5. 10. Wright JL, Lawson LM, Pare PD, Wiggs BJ, Kennedy S, Hogg JC. Morphology of peripheral airways in current smokers and ex-smokers. Am Rev Respir Dis 1983;127:474-7. 11. Hunninghake GW, Crystal RG. Cigarette smoking and lung destruction. Accumulation of neutrophils in the lungs of cigarette smokers. Am Rev Respir Dis 1983;128:833-8. 12. Keatings VM, Collins PD, Scott DM, Barnes PJ. Differences in interleukin-8 and tumor necrosis factor-α in induced sputum from patients with chronic obstructive pulmonary disease or asthma. Am J Respir Crit Care Med 1996;153:530-4. 13. Masubuchi T, Koyama S, Sato E, Takamizawa A, Kubo K, Sekiguchi M, et al. Smoke extract stimulates lung epithelial cells to release neutrophil and monocyte chemotactic activity. Am J Pathol 1998;153:1903-12. 14. Mio T, Romberger DJ, Thompson AB, Robbins RA, Heires A, Rennard SI. Cigarette smoke induces interleukin-8 release from human bronchial epithelial cells. Am J Respir Crit Care Med 1997;155:1770-6. 15. Takizawa H, Tanaka M, Takami K, Ohtoshi T, Ito K, Satoh M, et al. Increased expression of inflammatory mediators in small-airway epithelium from tobacco smokers. Am J Physiol Lung Cell Mol Physiol 2000;278:L906-13. 16. Wang S, Xu F, Chen Y. Detection and significance of interleukin-8,6, tumor necrosis factor-alpha in sputa from patients with chronic obstructive pulmonary disease. Zhonghua Jie He He Hu Xi Za Zhi 2000;23:465-7. (abstract- PMID: 11778258). 17. Yamamoto C, Yoneda T, Yoshikawa M, Fu A, Tokuyama T, Tsukaguchi K, et al. Airway inflammation in COPD assessed by sputum levels of interleukin-8. Chest 1997;112:505-10. 18. Soler N, Ewig S, Torres A, Filella X, Gonzalez J, Zaubet A. Airway inflammation and bronchial microbial patterns in patients with stable COPD. Eur Respir J 1999;14:1015-22. 19. Kanazawa H, Kurihara N, Otsuka T, Fujii T, Tanaka S, Kudoh S, et al. Clinical significance of serum concentration of interleukin 8 in patients with bronchial asthma or chronic pulmonary emphysema. Respiration 1996;63:236-40. 20. Wang F, He B. The effect of dithiothreitol on chemotactic factors in induced sputum of chronic obstructive pulmonary disease patients. Respiration 2009;78:217-22. 5 Are healthy smokers really healthy?